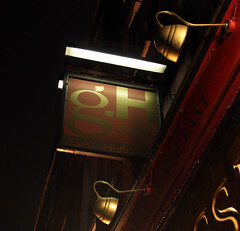 After a few days of our touring around England, my brother returned from his trip to Finland, and we decided to go out to dinner to The Gay Hussar in Soho. Around since 1953, the Gay Hussar has a long history. It’s the oldest Hungarian place in London. And for most of it’s history, it’s been a stomping ground for various liberal politicians and VIPs (indeed, at the table next to us was Labour’s Lord Borrie, talking with his colleagues about his upcoming second reading of some bill on passenger security and travelers’ rights). And the the walls of the Hussar are lined with caricatures of the various liberal VIPs that dine here (being American, I only recognized a single caricature that I could see from my seat: Jon Snow). So the place has some air of authenticity, even if it isn’t due to their culinary abilities: the place has been bringing in customers for 50 years. Dinner started well, with a nice selection of very hot peppers on the table (you don’t see a lot of hot peppers in the UK). These were both sweet and firey. After that, we moved on to appetizers, myself selecting their Hungarian charcuterie plate, and Carol selecting their chilled cherry soup. We both enjoyed our starters quite a bit: the soup was soft and pleasant, and the charcuterie plate had a nice variety of salamis on it. Moving on to the main course, I went on my brother’s suggestion and ordered the Becsi Szelet, which is basically Wiener Schnitzel. This was actually a very well done schnitzel, with a crisp breading, tender pork, and not a lot of greasiness. The chips, however, were a little soggy, but certainly not bad. I’d rate this overall a somewhat successful main course, although with a bit of room from improvement on the sides. 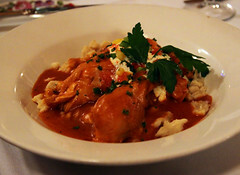 Carol instead opted for the sirkepaprikas (Chicken Paprikash). I only sampled a little bit of this, but was somewhat disappointed. The cream and paprika sauce was definitely more on the “cream” side, having very little bite to it. Being one of the hallmark dishes of Hungary, I was a bit let down by this, since over the years I’ve had some phenomenally good paprikashes. Alas, I think Gay Hussar’s 50+ years of being one of the only Hungarian places in London has resulted in them going soft. Dessert, however, is where the Gay Hussar made up some ground. 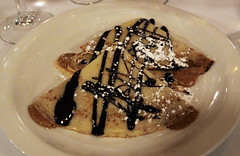 Several of us ordered the walnut pancakes (Gundel Palacsinta), which were very, very walnutty, nicely crisped, and served up with a nice bitter chocolate sauce. A bit pricey, but these were very flavorful and enjoyable, obviously made to order with a fair bit of care, and pleased everyone at the table. All in all, The Gay Hussar was a bit of a mixed bag. We were really expecting something more from them when it came to having what are basically Hungarian classics, but were left wanting. That said, the meal certainly wasn’t bad (and the dessert quite well done), and this place will be around for a long time, if for no other reason than tradition. We started day 2 of this year’s Burlington visit with a trip to Penny Cluse Cafe for breakfast. Looking over my notes, I was shocked that I haven’t written up Penny Cluse yet; I’ve been coming here pretty routinely since sometime in 2006, and have flickr photos of a half dozen breakfasts we’ve had here. So it’s not because of a lack of experience, or a lack of photos. I don’t know, sometimes these places just find a way to fall through the cracks. But this time I’ll address it. Penny Cluse (named after the owner’s late beloved dog Penny, if you were wondering about the name) is on the relatively short list of places that seem to be go-to spots for the Burlington crowd. The regular places seem to be Sneakers (which I have reviewed), Magnolia Bistro (which I have yet to try), and Penny Cluse. Located at the corner of Cherry St and Winooski Ave, it’s just around the corner from Church Street, so getting in here for breakfast on a Saturday can be a bit of a wait. An hour, in our case, until I managed to sweet-talk the hostess into letting us squeeze in at the counter (we did, after all, have another beer festival to get to! ).